21 campers and 1 counselor. Photo from 1970. By Gary Bloom, Owner/Director – My father was a P.E. teacher in Stamford. He wanted to start a day camp for young children. 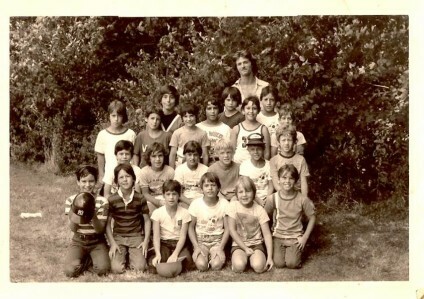 Camps were most typically offshoots of schools or clubs; creating a day camp out of raw property was a daunting enterprise and everyone let my father know this. They told him he was crazy. Fortunately the Breslow family thought it a viable idea and the Sywal Corporation was formed. The partnership was Sy and Adele Breslow and Walter and Pearl Bloom (Sywal comes from Sy and Walter). That was 1957, I was six years old living with my family in the Cove Beach section of Stamford. The first several years were none too easy. The Camp Playland parcel of land is landlocked with no street access. The only access could come off of Ponus Ridge Rd. in New Canaan. An access driveway was built, as were electrical lines, septic systems and a well. The first summer was a shoestring operation. The pools and the ball field were just being built. The original hill was only partially paved and it was half as wide as it is now. From a child’s perspective this was all exciting. Now, as an adult, I appreciate how hard my parents worked. My father continued teaching and working other jobs after school. My mother always worked outside of the house, separate from camp, while raising four children. My parents must have come from hearty stock. Sy Breslow was a Stamford dentist. They had three children. Very quickly the families realized it would be most ideal to live on the property. Two homes were built and the Blooms and Breslows resided at Camp Playland almost as one big family. We all worked. My father thought he was Ben Cartwright and we were living on the Ponderosa (TV show Bonanza). We raked the leaves, mowed the lawns and did all the maintenance work. Every year money from the summer was put back into the facility to build ballfields, the pond, play areas and other facilities. Sixty years later I know that my family and I are the beneficiaries of my parent’s dream. They were part of Tom Brokaw’s Greatest Generation. No challenge was beyond reach.